I love simple yet delicious desserts. This one takes the cake. Serve it with some fresh vanilla ice cream and you are set to impress! In a small bowl, combine the ginger, brown sugar, pecans and lemon peel. 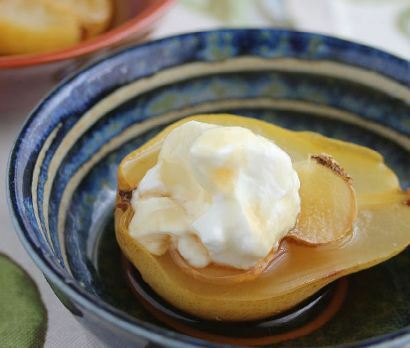 Using a melon baller or long-handled spoon, core pears to within 1/4-in. of bottom. Spoon ginger mixture into the center of each. Place pears upright in a 5-qt. slow cooker. Top each with butter. Cover and cook on low for 4-5 hours or until pears are tender. Serve with ice cream and caramel topping if desired. Yield: 6 servings.